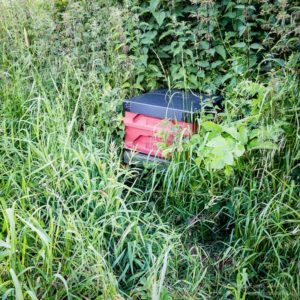 As I left my out apiary last Friday evening I gently tapped a bait hive buried in the grass and nettles and was met with a healthy buzz and a few inquisitive worker bees … it had obviously been occupied by a swarm in the last day or two, despite me not having seen any scout bees investigating it. I checked the hive on Sunday and found a small swarm covering about 3-4 frames with a dark, unmarked laying queen. She’s definitely not from my colonies as all mine in that apiary are marked and accounted for. At the back of the hive was an unoccupied wasps nest, beautifully constructed from paper-thin chewed wood pulp. This is the second bait hive with squatters this year. Although there’s a reasonable flow from something at the moment (early blackberry?) I gave them a couple of pints of syrup on Monday and Wednesday evening to help them draw comb on the foundationless frames that fill the box. 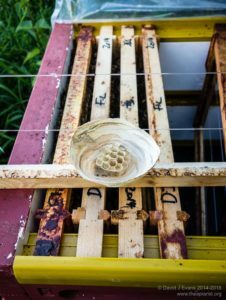 It’s not advisable to feed syrup immediately in case the honey stores brought with the swarm are contaminated with foul broods – by delaying feeding (or not feeding at all) the bees use their stores to draw wax. 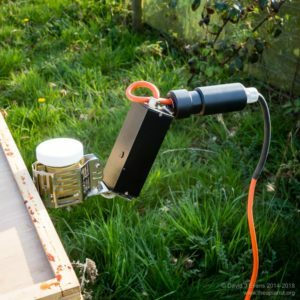 I also treated the colony – which has no sealed brood yet of course – with oxalic acid vapour from a Sublimox vaporiser (shown below being used early in the season on a full colony) bought a few months ago from Icko Apiculture. The phoretic mites on a swarm carry an unpleasant payload of viruses including deformed wing virus. It’s therefore good practice to keep the swarm in isolation until it’s known to be healthy, and to treat appropriately for mites as soon as possible. I also treated the churchyard swarm caught last Thursday with OA vapour despite not yet being sure whether the queen is mated or not – if she is then it’s best to treat before the colony have sealed brood, if she isn’t then OA vaporisation is sufficiently ‘gentle’ that I don’t expect the treatment to interrupt her from getting out and mated in the current good weather. By treating with OA vapour late in the evening I wouldn’t interrupt a mating flight and could be pretty sure that most of the bees – and therefore most of the mites – were ‘at home’. It’s good practice to keep records on where swarms were found, hived and how they were subsequently treated. This entry was posted in Beekeeping, Swarms, Varroa control and tagged bait hive, foundationless, oxalic acid, swarms, Varroa, wasps on June 24, 2015 by David.